Sen. Chip Shields is sponsoring HB560, a bill that would ban racial profiling. Sen. Jackie Dingfelder co-sponsored HB560 and HB3409, the Natural Hair Care bill. Rep. Lew Frederick led the charge to close the loophole in Oregon's Public Accomodations Act through HB2668. Sen. Jackie Winters has been a force behind criminal justice reform and sponsored SB463B, which requires racial impact statements for changes to sentencing and child welfare policy. Oregon's Communities of Color coalition has been lobbying the Salem Legislature in support of a slate of bills designed to promote racial justice and address disparities across the state. Some of those bills have passed; others are still under debate. This Tuesday, June 15, activists met in Salem to support SB560, The End Racial Profiling bill. The bill would ban racial profiling tied to personal descriptions or circumstances, except in cases where law enforcement has received information tied to a specific case. Sponsored by Sens. Chip Shields and Jackie Dingfelder and Rep. Michael Dembrow, the bill would require all law enforcement agencies to take steps to eliminate profiling and to investigate complaints about profiling. The Attorney General would have to create an independent complaints procedure. "Profiling happens every day in our communities," said Andrew Riley public policy director for the Center for Intercultural Organizing, which took supporters to Salem to speak at a public hearing. "When people are considered suspects because of who they are, it erodes our communities' ability to trust law enforcement, makes our families less safe, and violates basic principles of fairness." Currently the bill is under discussion in the Judiciary Committee. Riley says this week's public hearing is vital to building support for a ban on racial profiling in Oregon. Major policy changes often take more than one year to pass. "We view this as the first step of a long-term strategy to pass this bill," Riley said. Also under debate is House Bill 3194, a slate of reforms to the criminal justice system that would reduce Oregon's prison spending while protecting community treatment, prevention and re-entry programs. Sponsored by Reps. Chris Garret and Andy Olson, and Sens. Jackie Winters and Floyd Prozanski, the reforms are not specifically aimed at racial equity. Yet, they would have a deep impact on Portland's Black community, which is afflicted by high rates of incarceration. Controversial because of proposals to remove some mandatory sentences, the bill has yet to emerge from the Joint Committee for Public Safety. Senate Bill 463B A racial impact bill that requires the Criminal Justice Commission to issue racial impact statements for any laws that affect criminal sentences or child welfare, and when two legislators—a Republican and a Democrat– request one. The bills' sponsors, Sens. Chip Shields and Jackie Winters, say the new law is needed because of glaring racial disparities. African Americans make up about 2 percent of Oregon's general population, for example, but about 10 percent of Oregon's prison population. Sen. Chip Shields, D- Portland, has been working to pass a racial impact law since 2009. "This bill gives legislators an important tool to use in assessing whether policies we propose give a fair shake to every Oregonian," Shields says. "After years of hard work I'm proud the bill garnered such broad bipartisan support this session and I'm thrilled to see it move forward." Sen. Jackie Winters, R-Salem, said the bill will ensure the impact of laws on communities of color is taken into account. "Like in the State of Iowa, this bill will allow Oregon legislators to make informed decisions when crafting solutions to crime, child welfare, and delinquency," Winters said. "This bill also helps to ensure that racial justice costs are included in the public dialogue regarding criminal justice choices." House Bill 2668 Closes a loophole in Oregon's Public Accommodations Law of 1953. The original law banned discrimination by any business in the state on account of race, religion, color or national origin. But a court decision found that it did not cover publicly owned facilities. 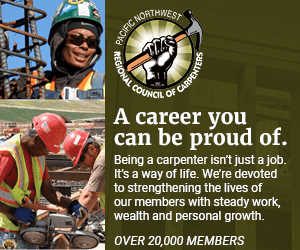 The current bill, sponsored by Rep. Lew Frederick and supported by Bureau of Labor and Industry chief Brad Avakian would close that loophole and "apply the same standard of non-discrimination to publicly owned enterprises that commercial establishments have been subject to for 60 years." HB 3409 Last year The Skanner News reported that hair braiders in Oregon were prevented from practicing their craft unless they studied how to use chemicals, learned to cut hair, and paid for expensive Cosmetology training and licensing. Legislators Alissa Keny-Guyer, Jackie Dingfelder, Tim Kopp, Rod Monroe and Lew Frederick rose to the challenge with a bill that exempts stylists who work with braiding and natural hair styles from studying for a full cosmetology license. Problem solved. SB 833 The drivers license bill that allows the Department of Transportation to issue drivers licenses to applicants who don't have proof of legal residence, so long as they have met other driving requirements and have lived in Oregon for at least a year. Sponsored by, Sens. Chip Shields, Arnie Roblan, Chuck Thomsen, Bill Hansell, and Reps. Jules Bailey, Chris Harker, Lew Frederick, Jessica Vega Pederson, Mark Johnson and Vic Gilliam. See a full list of the Urban League of Portland's priority bills and what happened to them.